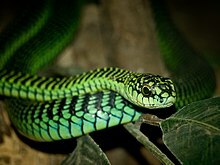 A boomslang is a large, venomous snake found in Africa. Its name means "tree snake" in Dutch and Afrikaans. Boomslangs eat small animals like chameleons, frogs, and birds, but they also eat eggs. Like all snakes, boomslangs do not chew – they swallow everything whole. This page was last changed on 4 August 2018, at 03:19.